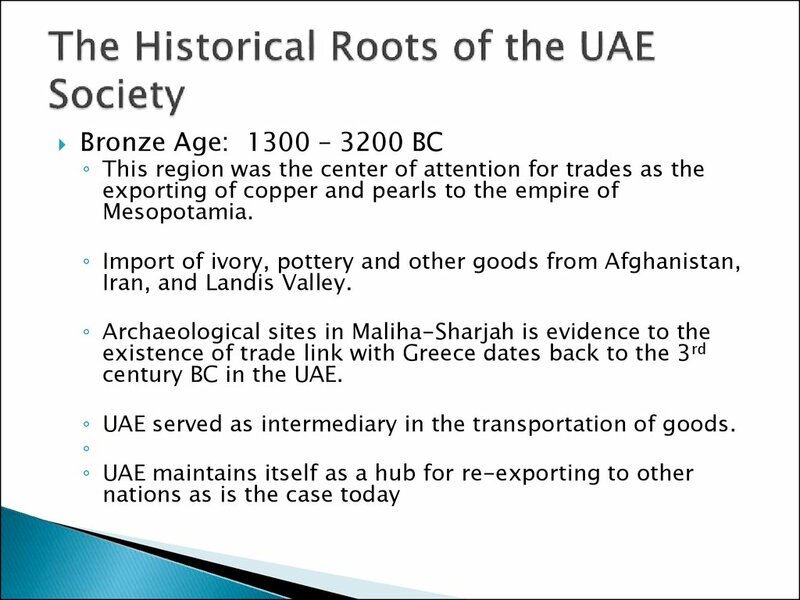 century BC in the UAE. 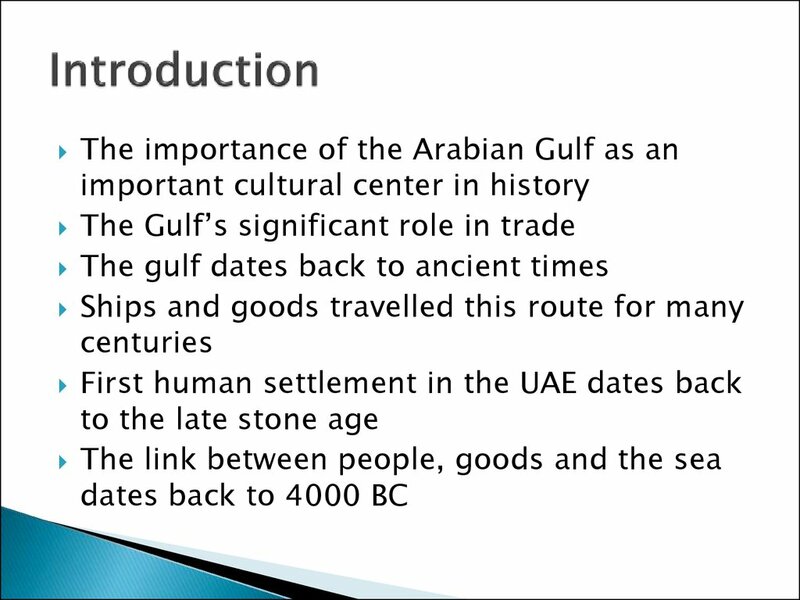 ◦ UAE served as intermediary in the transportation of goods. 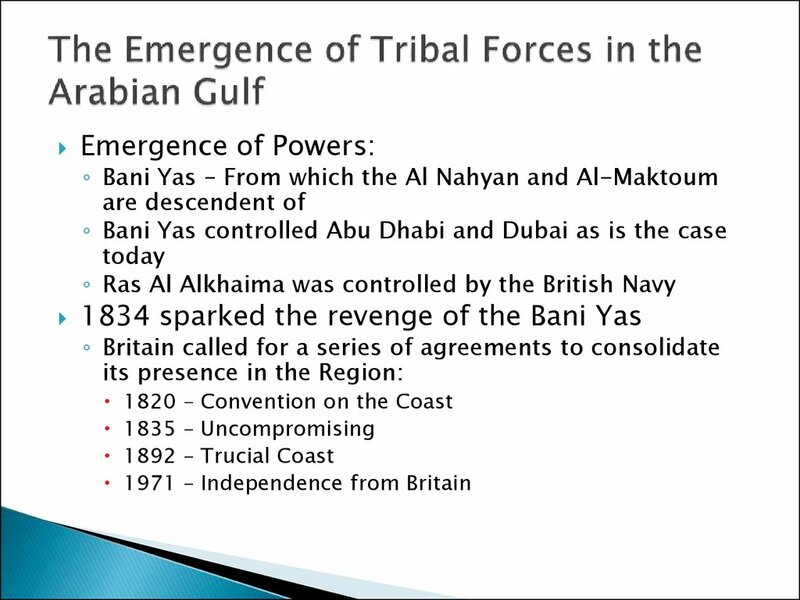 Arabian Gulf and the northwestern coast of the Gulf of Oman. bonds in an 1892 treaty. 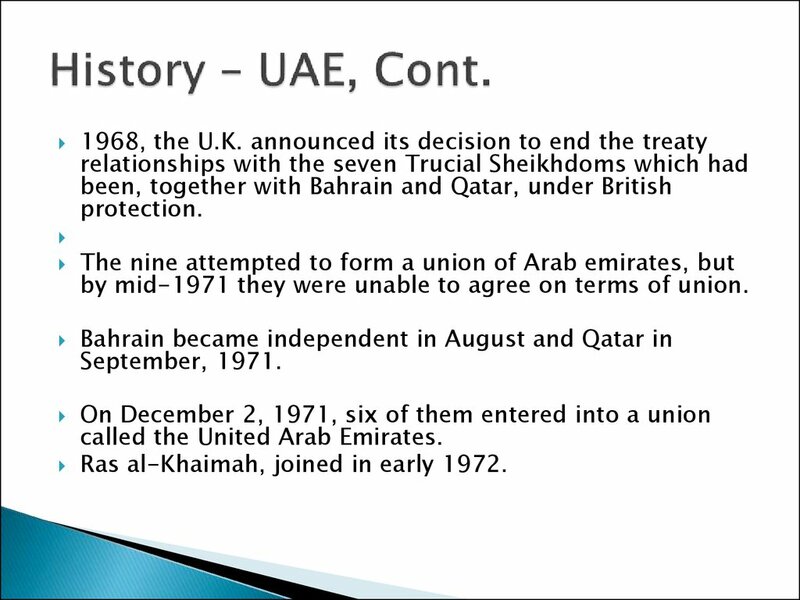 agreement was never ratified by the U.A.E. 11. 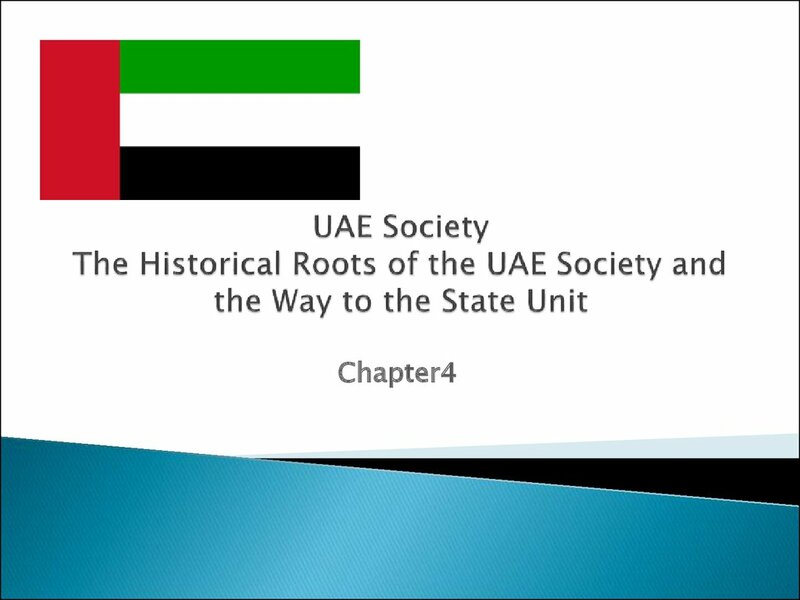 History – UAE, Cont. by mid-1971 they were unable to agree on terms of union. called the United Arab Emirates. Ras al-Khaimah, joined in early 1972. 12. 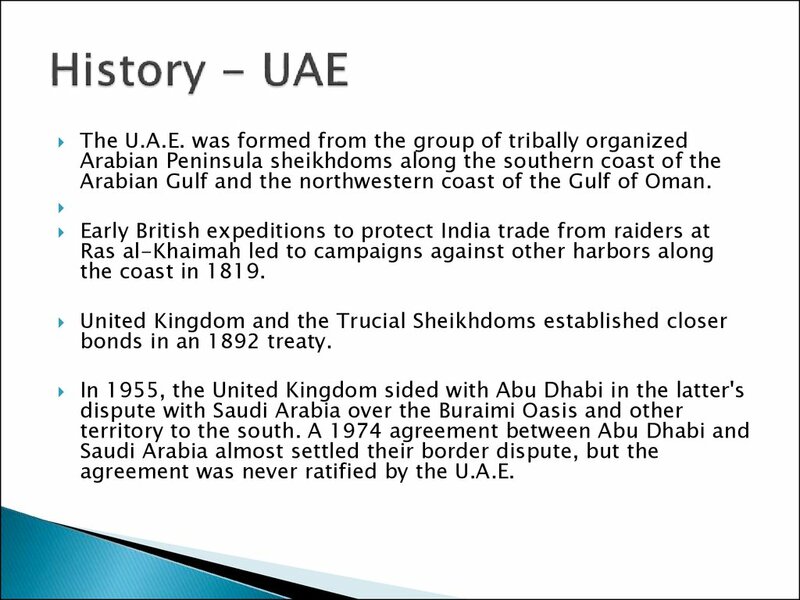 History – UAE, Cont. Zayed Al Nahyan as U.A.E. Federal President. 13. 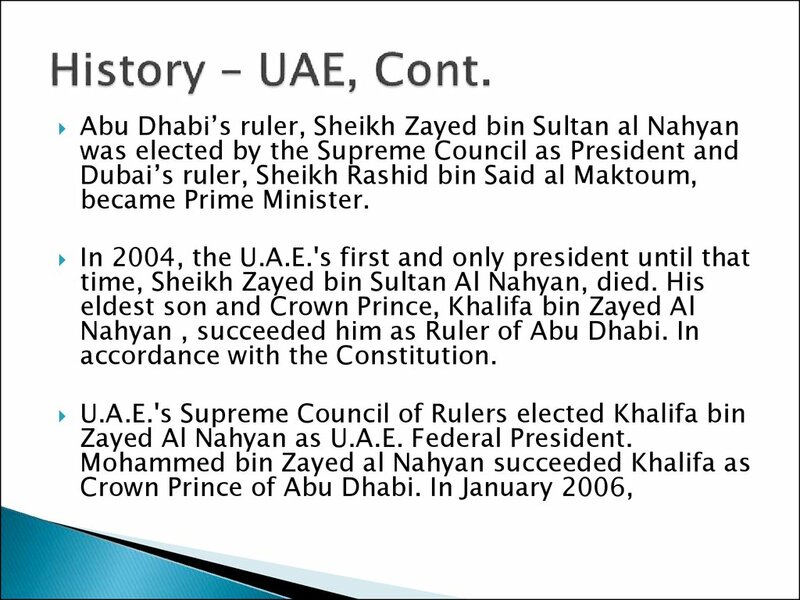 History – UAE, Cont. Major cities: Capital--Abu Dhabi; Dubai. 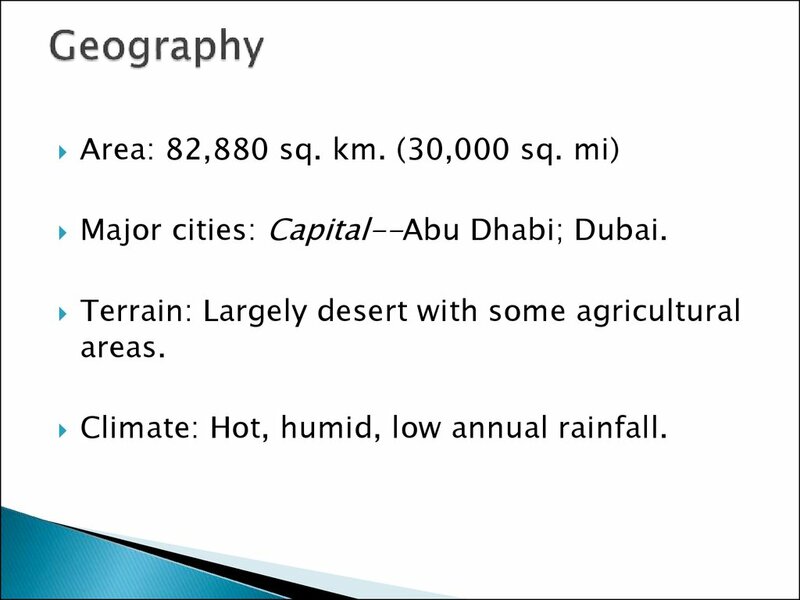 Climate: Hot, humid, low annual rainfall. 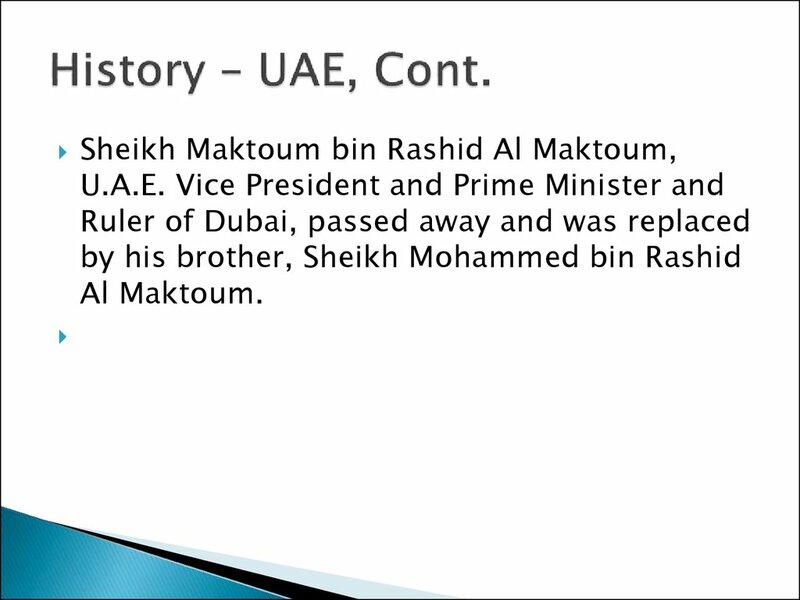 Nationality: Noun and adjective--U.A.E., Emirati. Population (2009 est., U.A.E. Government): 8.9 million. Education: Years compulsory--ages 6-12. 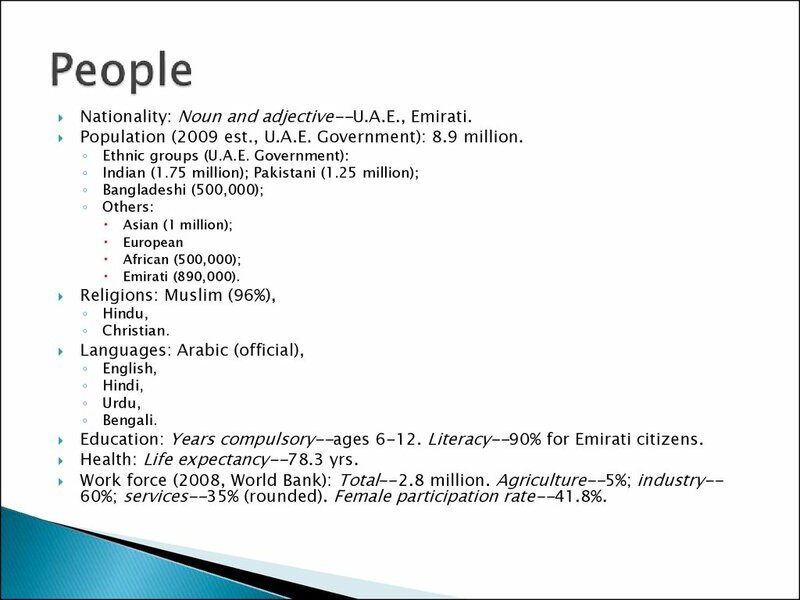 Literacy--90% for Emirati citizens. Work force (2008, World Bank): Total--2.8 million. Agriculture--5%; industry-60%; services--35% (rounded). Female participation rate--41.8%. 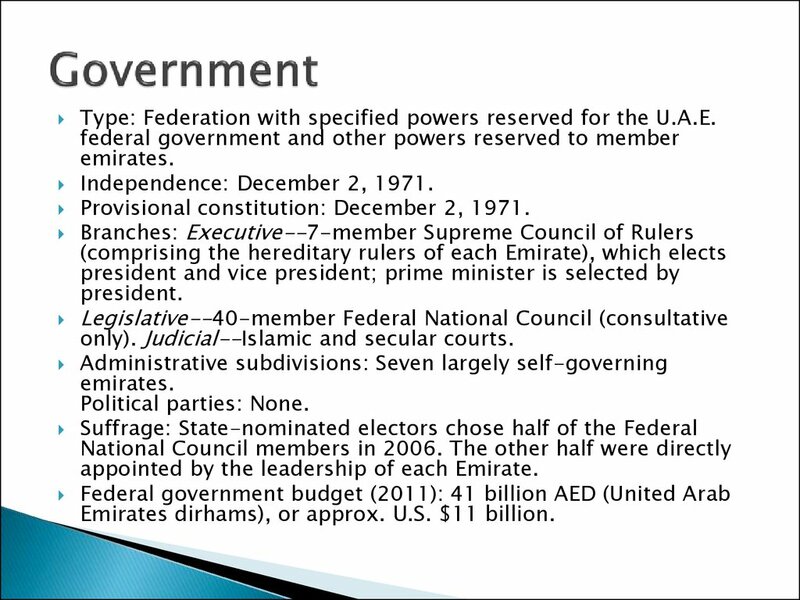 Type: Federation with specified powers reserved for the U.A.E. Provisional constitution: December 2, 1971.
only). Judicial--Islamic and secular courts. 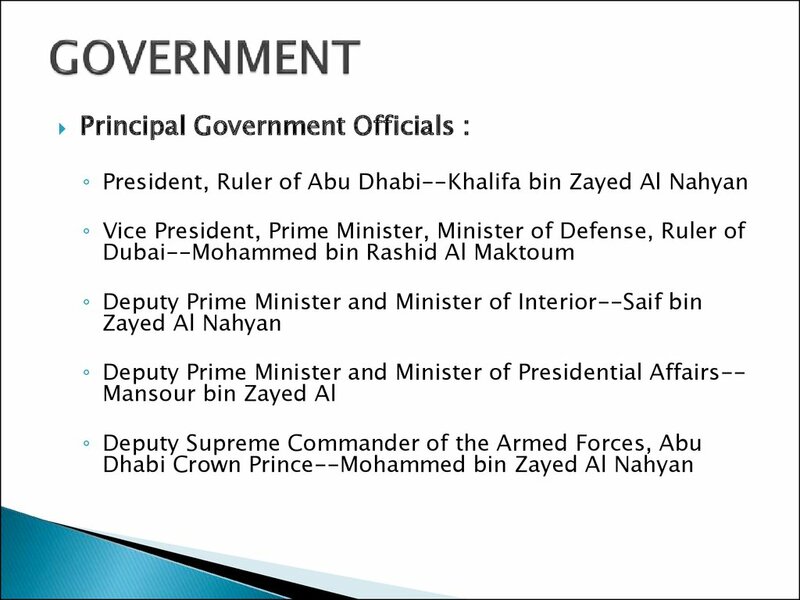 appointed by the leadership of each Emirate. Emirates dirhams), or approx. U.S. $11 billion. 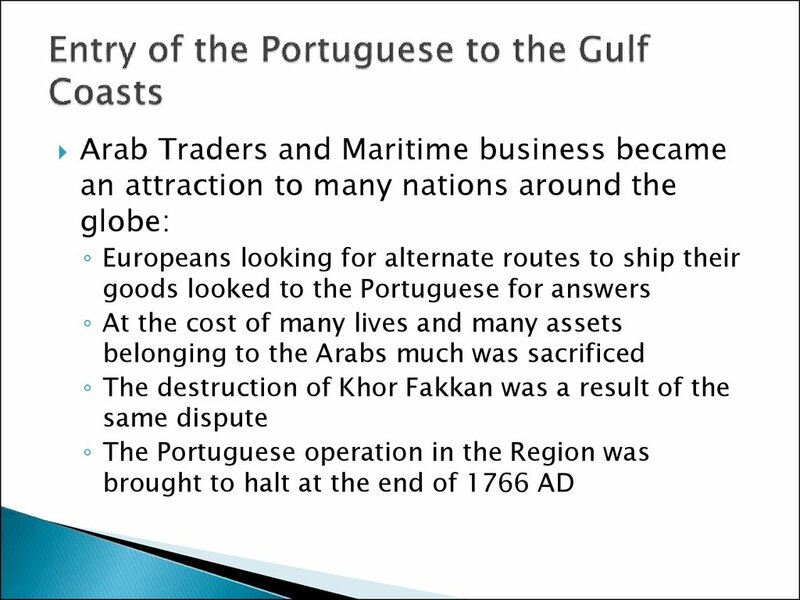 GDP (2009): 914.3 billion AED (approx. U.S. $248 billion). Annual growth rate (2007): 6.3%. Per capita GDP (2008): over U.S. $53,400. ◦ Oil and natural gas. ◦ Petroleum (2008 est. ): 36.8% of GDP. 12.2% of GDP in 2008 (est.). 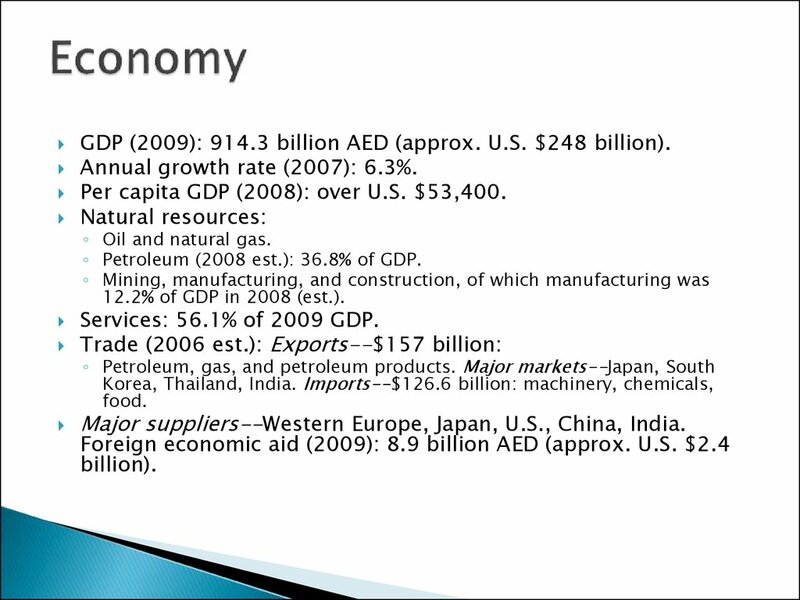 Services: 56.1% of 2009 GDP. Major suppliers--Western Europe, Japan, U.S., China, India.